We are so excited to introduce the newest member of our ‘Breast Cancer Allies’ program, BrandBrief. We met BrandBrief’s CEO, Simon Moss, through sheer luck while I was sitting in my office. I overheard him mention that his personal mission was to help support charities through their newest influencer app. WELL, did I have a great non-profit for him! I shared Bob and Linda’s story and within hours, he ordered his tutu. Little did we expect that he would go 100% “Ballerina Bob” in the middle of the Flatiron in New York City! Simon is a man of his word. His enthusiasm and dedication to philanthropy are truly admirable. 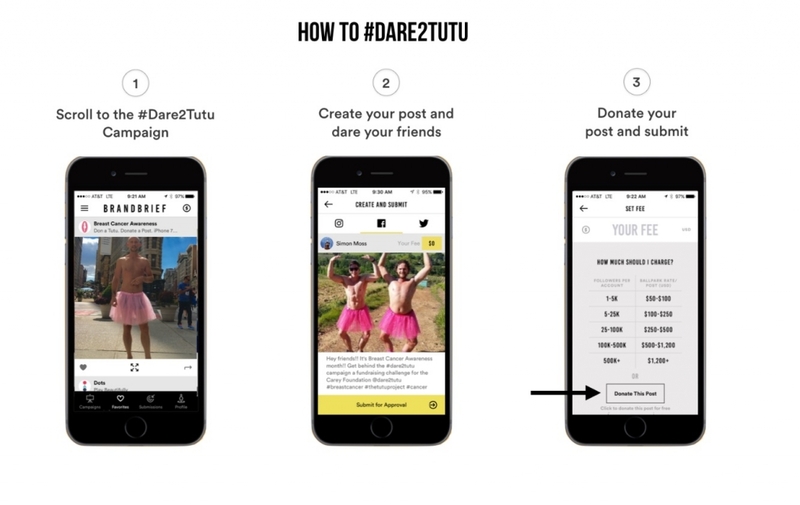 Thanks to BrandBrief, social media influencers can participate in our #Dare2Tutu breast cancer fundraiser and have a chance to win an iPhone 7! The winner will be selected by Simon, Bob, and Linda at the end of October, which is breast cancer awareness month. We look forward to working with the BrandBrief team and exceeding our fundraising goal of $50,000. Supporters can also make a direct donation to the BrandBrief team page.